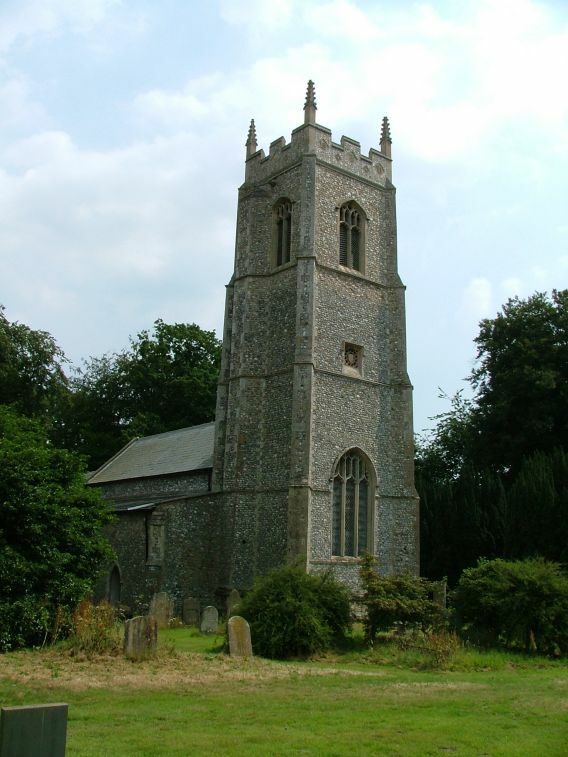 This stately church is just to the west of the more famous Worstead. 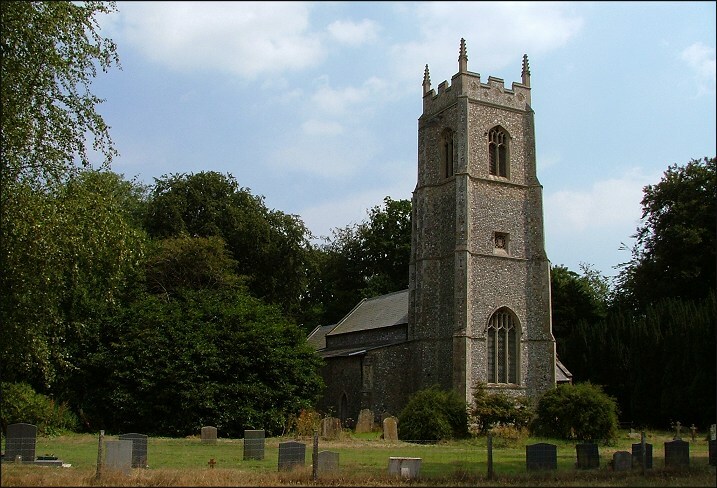 That mighty building is visible for miles, but you might not even know that St Botolph is there, because it sits about a quarter of a mile from the road, in woodland. A driveable track goes up to it, but we cycled here on a hot day at the end of July 2006. A massive pillar of smoke rose above the trees from a cornfield fire on the way to Worstead. It looked like something out of the Old Testament. 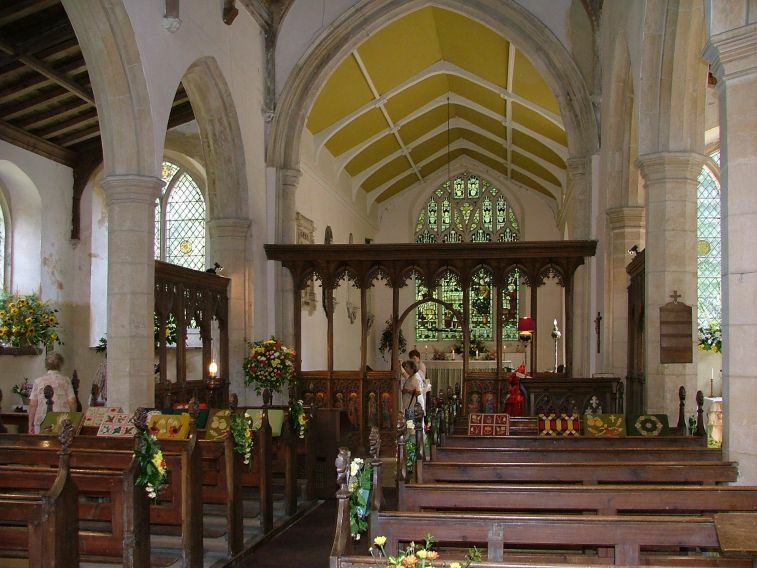 St Botolph is a grand affair on a small scale, with aisles but no clerestory. 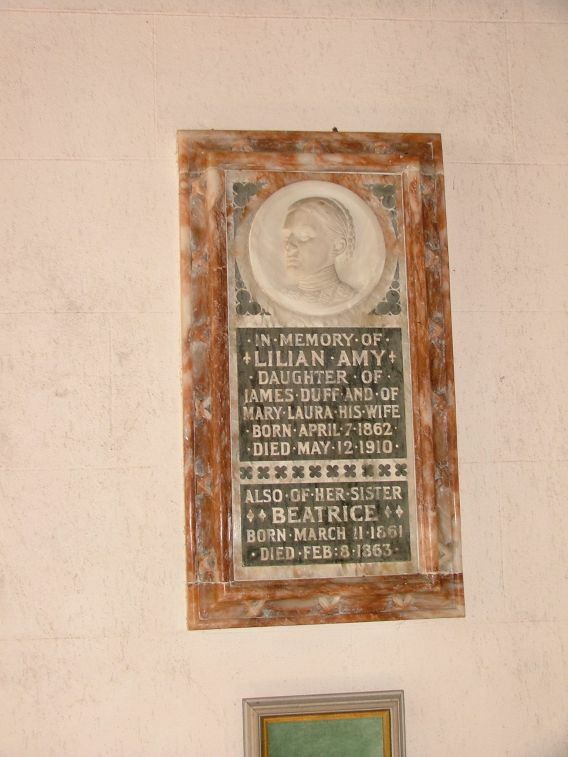 Was there once a clerestory? Possibly. This church had a major going over thanks to rich patronage in the 19th century, when a lot of the outer walls were refaced. But it was done well, and this is an attractive building, albeit rather hard to photograph with all the trees surrounding it. 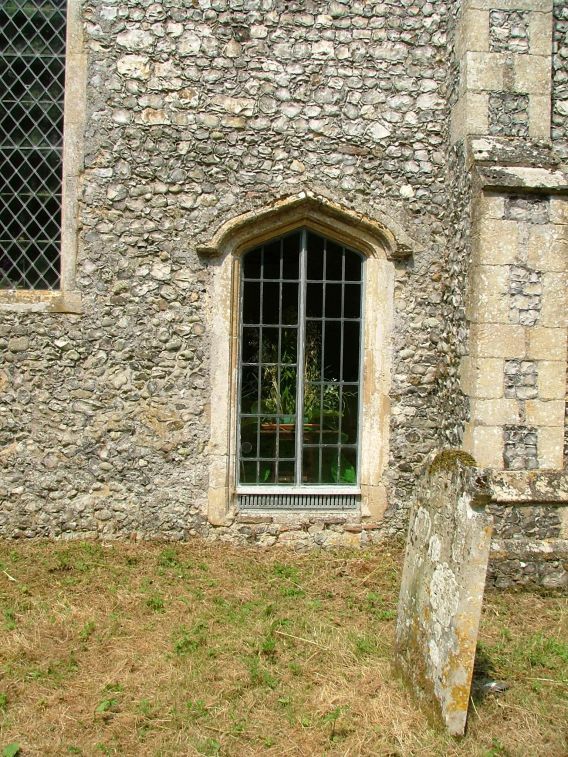 Most unusually for this part of Norfolk, St Botolph is kept locked. 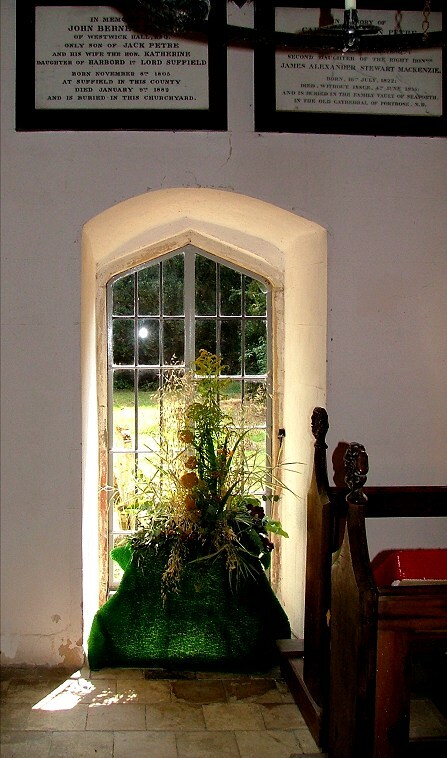 They welcome visitors, and there is a key; but you will have to go to Worstead Rectory to get it, so unless you are in a car it might be worth going there first. 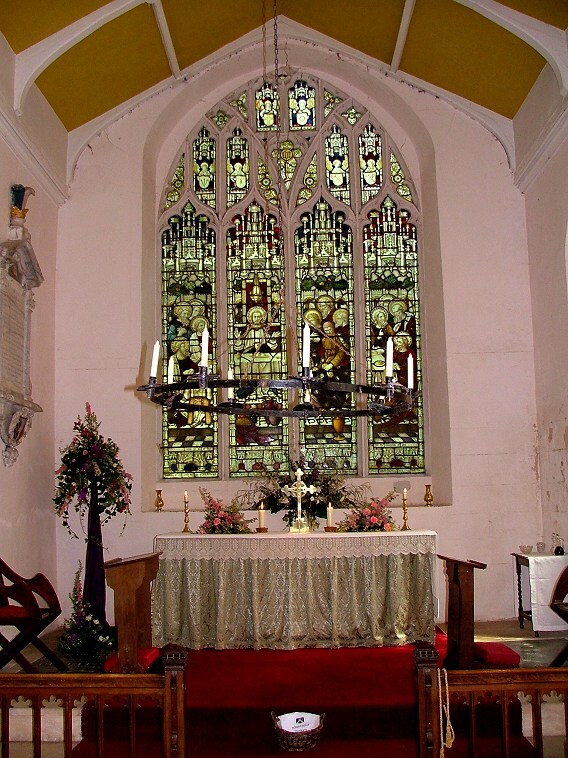 On the day of our visit I knew that the church would be open, because I had seen a poster in Swanton Abbot church saying that there was a flower festival. I was in two minds about this; it was good that we wouldn't have to cycle into Worstead to get the key, especially as the Worstead Arts Festival was on, which made it unlikely the Rector would be in, but flower festivals can make it impossible to photograph the inside of a church, and easy to miss interesting features. I needn't have worried. 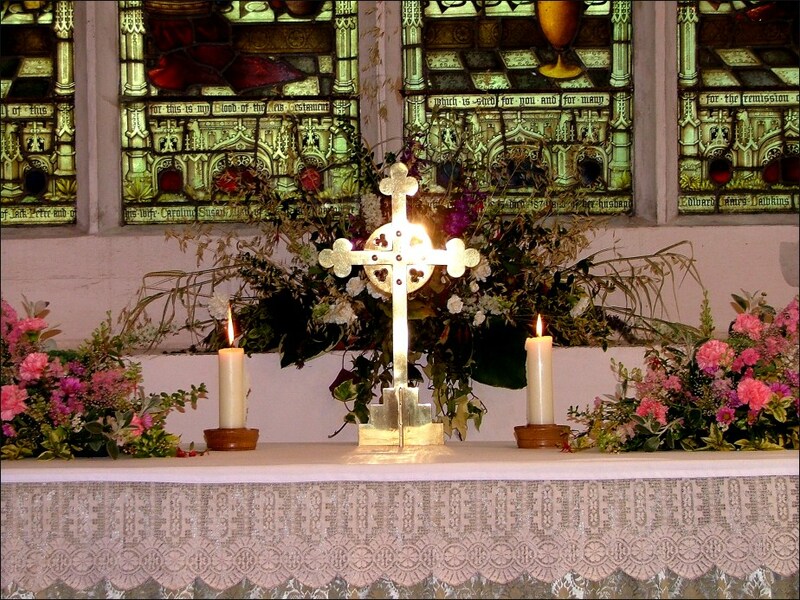 Westwick flower festival was on a fairly small scale, and there were not really many more arrangements than you would expect for the average wedding. As I say, I'm not a fan of flower festivals, but it was done well. It looked nice. There were about a dozen people milling about at the back of the church, and they all seemed to know each other. And here's a strange thing; not one of them greeted us as we came in. I don't mean that we were treated with suspicion, or received cold, hard stares - far from it. We might just as well have been wearing invisibility cloaks. Now wouldn't you think that the arrival of two strangers in shorts, one a wild-haired man with a camera and the other a 13 year old boy, might have been a cause for comment? This sounds like a moan, and it isn't meant to. 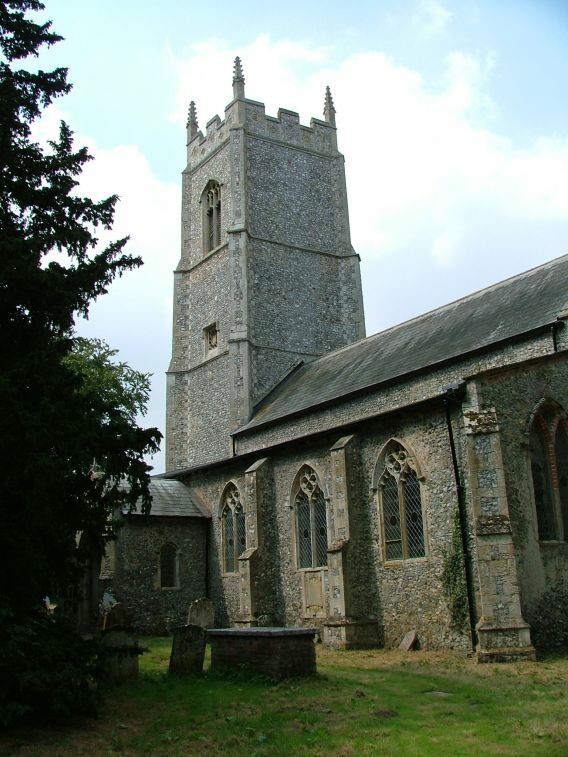 St Botolph struck me as a welcoming, friendly place. It was just a bit, you know, odd. I'm not complaining, because it allowed us to have a look around in peace, but it surprised me that they didn't treat it as an opportunity to make two strangers feel at home. After all, we might have been potential new blood, and as Jimmy said afterwards, "we'd have had to wait an awful long time for anyone younger than us to come in there, dad." Westwick Hall was home to the Berneys and then the Petres. Both families were fabulously wealthy, and a lot of money was spent doing this place up in the 19th century. There are parclose screens to both aisle east ends, but they look Victorian to me. 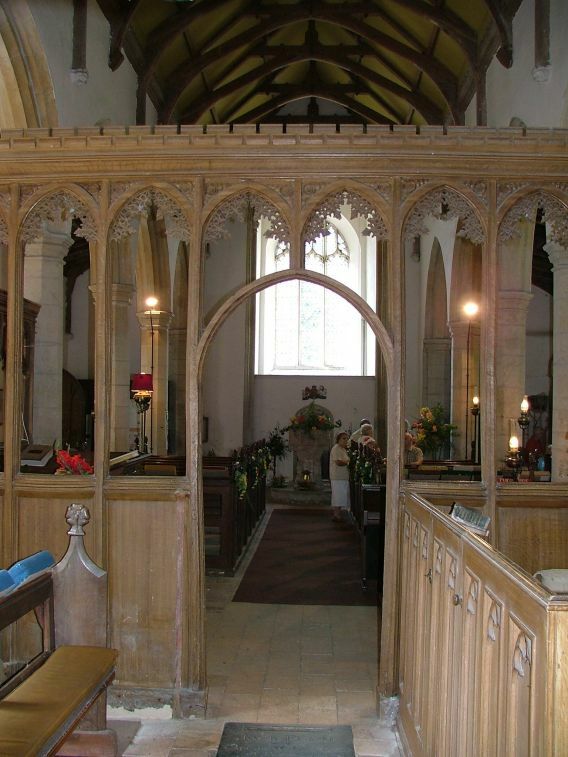 The screen across the chancel arch is 15th century, and rather good; but again, it has been extensively restored. 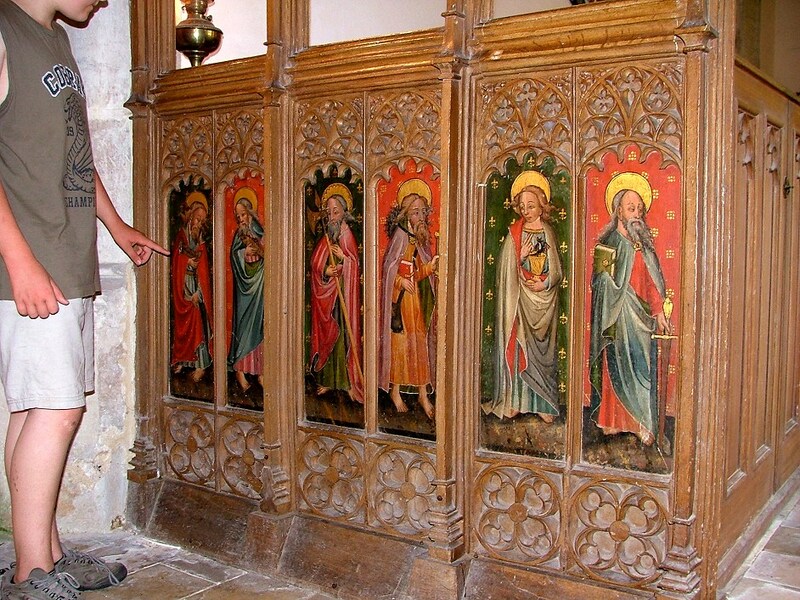 It depicts the apostles, and it is interesting to compare it with the same thing in a much more rustic hand at neighbouring Swanton Abbot. 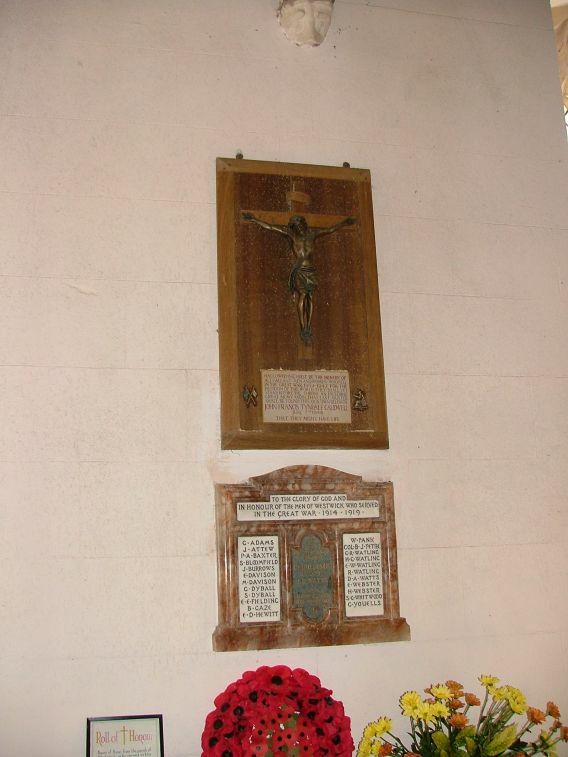 On the north side, the figures are St Jude with his boat and St Simon with his fish; St Matthew with his halberd and St James with his pilgrim staff and purse; and St John with his poisoned chalice and St Paul with his sword. Unfortunately, there was a large arrangement in front of the south side of the screen, which made photography impossible. I considered moving it, but I thought that that my invisibility cloak would probably stop working if I did. 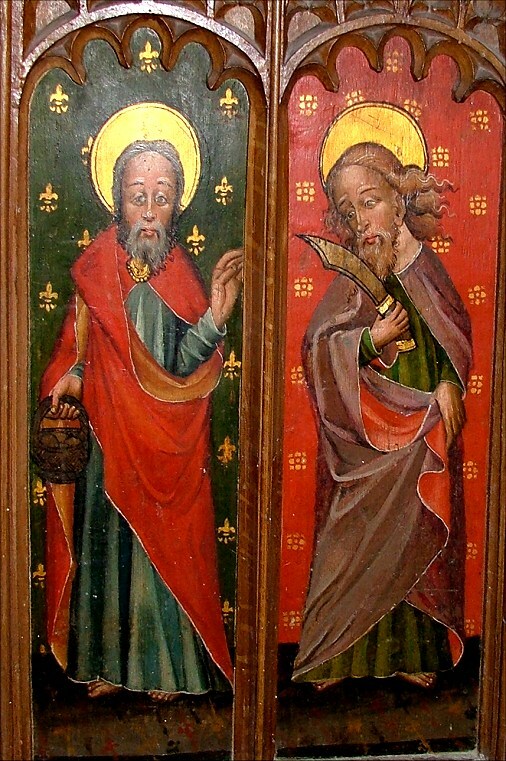 In any case, I could still photograph the last two figures, a rather disconsolate-looking St Philip, with his basket of loaves, and St Bartholomew, with his flencing knife. They look a bit as if their picnic has just been rained off. 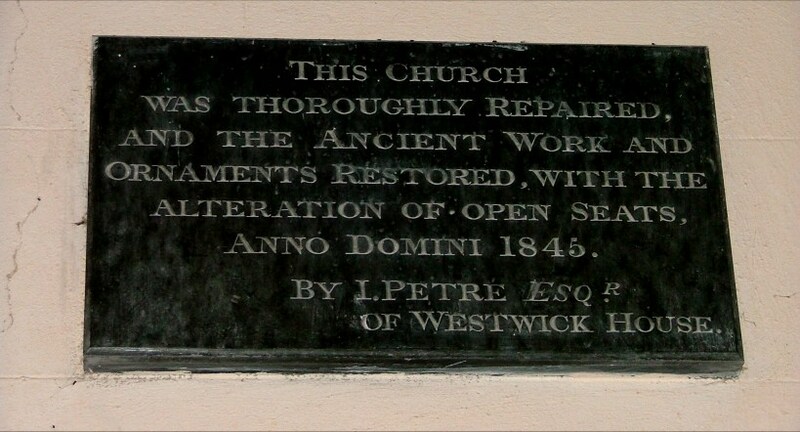 Up in the chancel, the priest door has been removed, and the opening glazed. This looks so good, I wonder why it is not done more often. The only other time I recall seeing it is at Hartest in Suffolk. 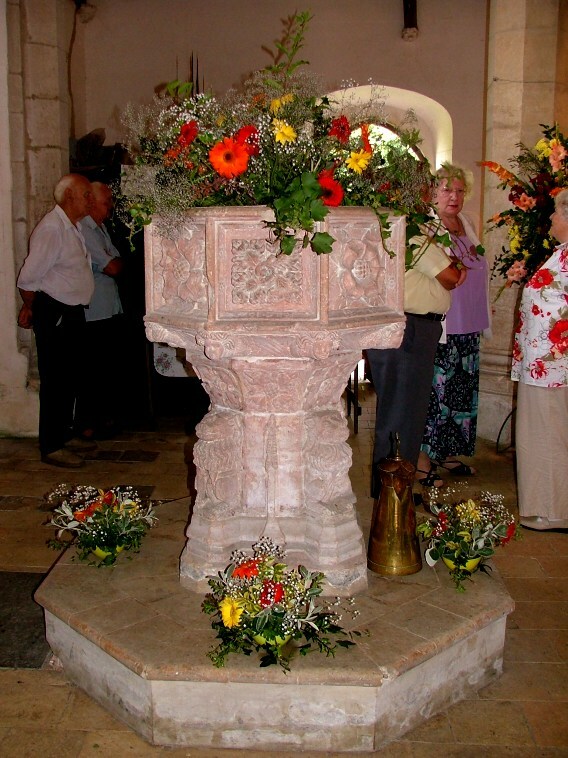 Apart from the screen, the star of the show here is the 15th century font, which is magnificent in a part of Norfolk where they tend to be older and rather more humble. 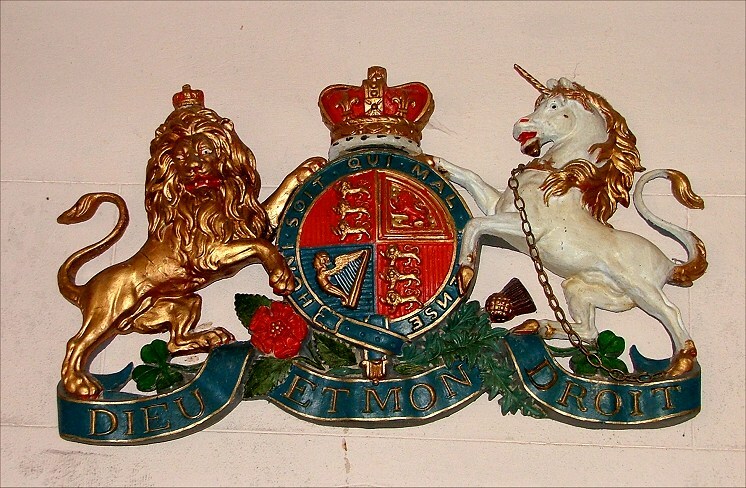 The moulded Victorian royal arms were probably bought off the shelf and painted locally. 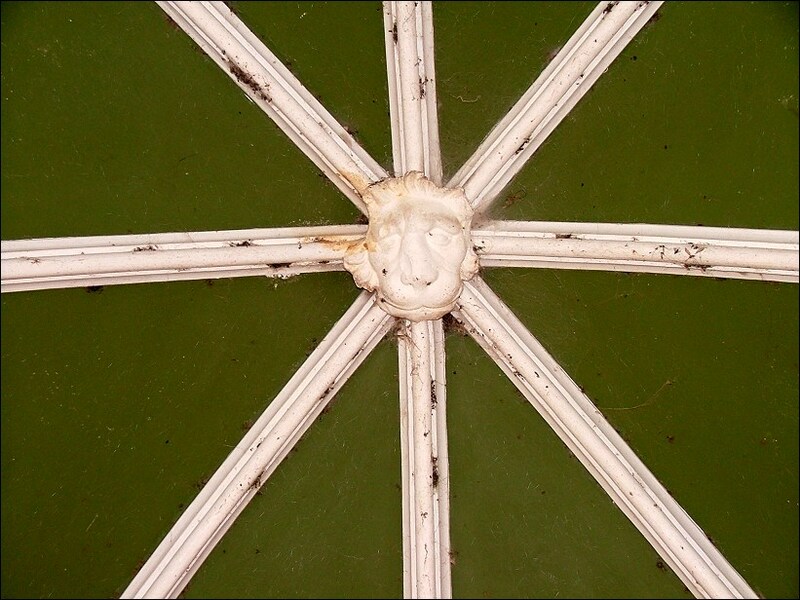 Speaking of painting, the ceilure of the chancel roof is olive green. As you leave, you might notice that the same thing has been done to the ceilure of the 14th century vaulting of the porch, which is striking, to say the least; I think that this is probably how such porch vaulting had been painted originally. Another tower peeping above the trees just to the east, and visible from the Norwich to North Walsham railway line, you might take to be that of a round tower church. It is in fact the obelisk, an 18th century folly. 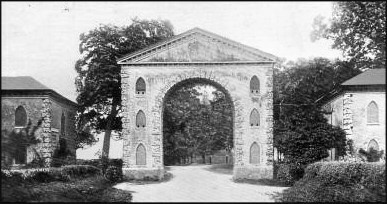 Beside it, spanning the North Walsham to Coltishall road, was the celebrated Westwick arch, which was finally demolished in 1981. You can see an old photograph of it at the bottom of this page.